Originated in southern Brazil. Also known as Strawberry or Cattley Guavas after William Cattley, an English horticulturist who encouraged its cultivation in England in the early 1800s. Cattley guavas are excellent for landscaping, can be grown in large containers and fruit, can also be grown as an ornamental hedge. 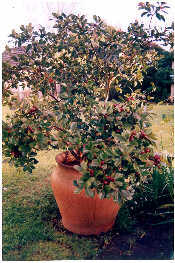 Strawberry Guavas are good for home gardens for their ornamental properties, their non-invasive root system and their attractive foliage and flowers. Guavas are exceptionally rich in vitamin C and are good source of niacin, potassium and dietary fibre. They provide 62 kilocalories per 100g/3oz. Trees are best grown in full sun can grow with little shade. Good salt tolerance, protect when small from wind. Can tolerate freezing temperatures down to -5.5c without damage, and even lower for brief periods. Young trees are less cold tolerant and need extra protection. Have a climatic range similar to orange trees. The yellow form is more cold tender than the red fruited form. Guavas can grow in poor soil. Drought tolerance is high in the red-fruited species, with the yellow-fruited types being more tolerant to short periods of flooding. Trees produce better-quality fruits if given regular moisture during fruit formation. Plant red fruiting varieties 2-4 metres apart. Plant yellow fruiting varieties up to 4 metres apart. Balanced fertiliser 2-3 times a year when trees are young, with applications still continuing as the tree matures, but of lesser amounts. Add calcium and magnesium, as well as the micronutrients. Prune in late autumn or early spring. Flowers and fruits are produced on the present seasons growth, so do not prune once spring growth has commenced. Guavas can be pruned or trained to form a large bush to allow easier harvesting, or into a small tree with a single trunk. This plant has very few problems with pests & diseases. But can get fruit flies going for the fruit. Birds love to feast on these fruit, bird netting may be needed.